Increasingly tech companies are moving to Shenzhen, Taipei and Seoul. 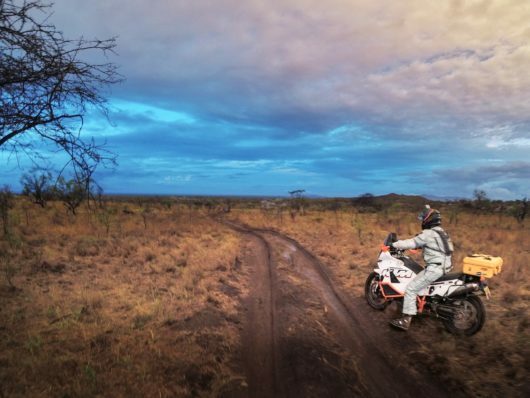 At the same time, BRCK is getting itself further and further into the remotest parts of Africa. We are a unique company, and we have a unique perspective on tech that makes life mostly hard, but ultimately fulfilling. We talk a lot about ‘You can do hard things’, however now, we’ve come to the realization that ‘We make things hard’ is becoming just as true. But it’s our customers that do harder things. 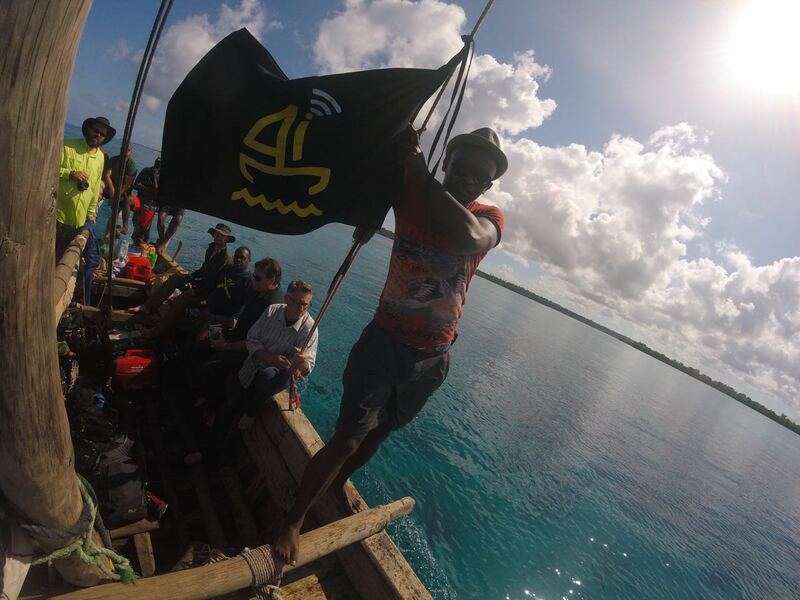 Coming to Pemba has given the team here a glimpse of what island life and the challenges that come along with it. The goal today was to install a small weather station at the lighthouse on Pemba. We’ve installed these weather stations before in various places, including on Mt. Kenya and this was a good excuse to test the new PicoBRCK V3. PicoBRCK is an IoT gateway and edge node. 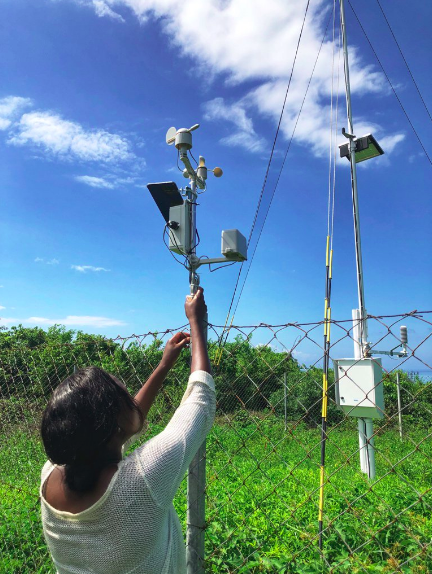 We’ve been working on this now for a few years, slowly perfecting what it means to connect sensors in some of the remotest parts of the globe. The weather station we’ve used as the base is mostly unexciting, however, the PicoBRCK is. The V3 now includes remote OTA updates, onboard flash storage and even lower power usage than before. But what we learned was completely unrelated. Arriving at the lighthouse Liz and Birir began to prepare the weather station, the team had shipped some new base firmware, so we needed to do a manual upgrade of the device before putting it online. First thing to do was to download all the tools to flash the firmware, so out came the SupaBRCK and within moments we’ve got the truck set up as a mobile hotspot, a quick skype call back to BRCK HQ and we are off again. Lesson 1. Third party tools make life hard when you are alone. We’re more privileged than most, travelling with SupaBRCK has meant that we’ve had pretty constant access to communication, something that isn’t a reality for most here. Without the SupaBRCK, we would have never gotten the firmware updated, and the weather station would never be up. We need to make our offline tools work for those who are offline. We’ve been building online tools for a while, and in building those out, sometimes its easy to forget that you’re a long way from online a lot of the time in remote areas, sometimes that little bit of information can help you get connected faster. 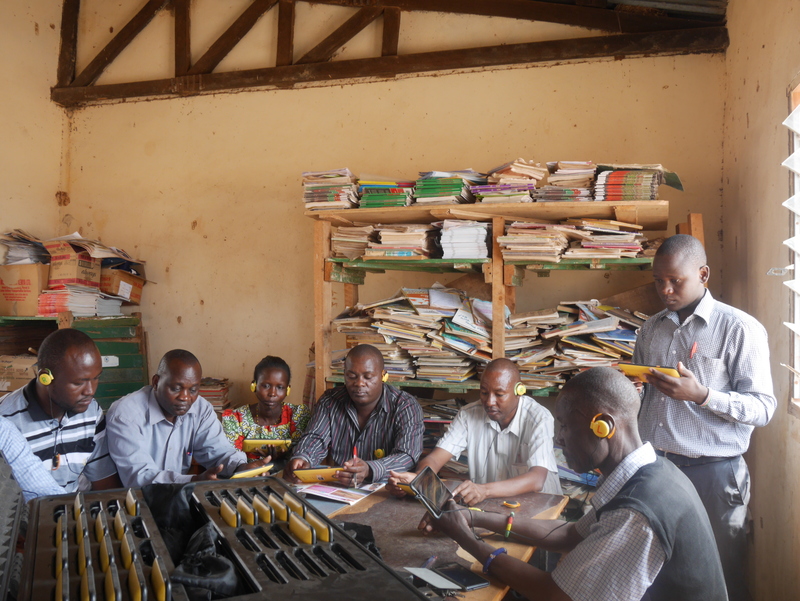 Once we had the system set up, it was about getting it up and reading real data. Mark, who’s spent a lot of time in Tanzania, we set to talk to the Yusef, the lighthouse keeper to get his blessing. Well it turns out we didn’t have the approvals we thought we did, and we had to improvise to make it work. Lesson 2. Flexibility is critical when you are expecting the unexpected. When we got permission to mount the weather station, we had to work out how to mount this. One of the great thing about PicoBRCK is its small size, but the weather station was bigger. How to mount this. We’ve been thinking a lot about different options for mounting the PicoBRCK and the SupaBRCK, however sometimes in the office its too easy to think about standardizing everything, and trying to force our installs into simple boxes. Mounting the weather station involved everything we had in the toolbox, every zip tie we had and scavenging U-bolts from every antenna. Deploying with all eventualities in mind, and the ability for the hardware to be flexible is critical. We loaded up the daladala’s again with all the gear and people and set off to the new digs, Verani Beach, our home for the next 3 nights. Everyone got sorted out, went for a swim and chilled out for a bit. Brandon from the Good All Over team got out the drone and headed out over the ocean. All of a sudden Brandon bolted up and ran at full speed towards the sea, a few people looked up, but no one connected his urgency with the splash of moments ago. Minutes passed and finally the penny dropped that Brandon was chasing the drone as it bubbled towards the ocean floor. 6 of us jumped up and chased Brandon down. ‘He’s got it… come the f#$k back!…’ repeated from the shore. We hauled the drone out, and Brandon, exhausted from 300m of race pace swimming and countless repeated dives needed hauling out as well. A DJI Inspire drone is an amazing piece of machinery, designed in Shenzhen, the greatest electronics and robotics community in the world. 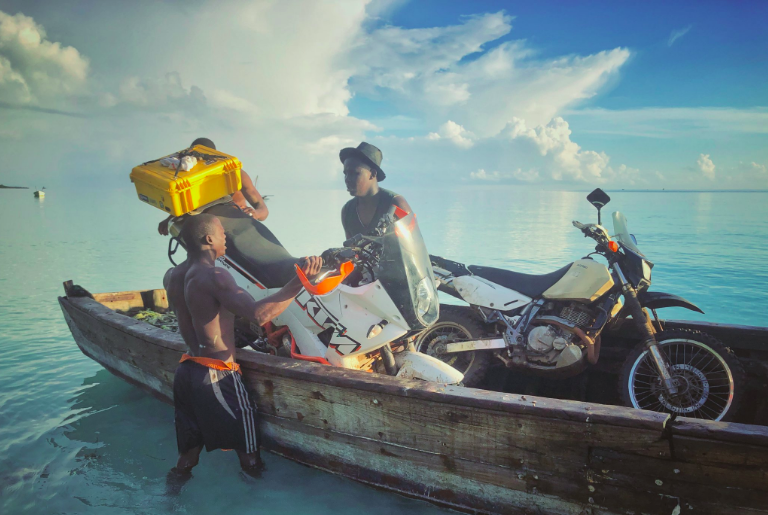 It wasn’t meant to be field stripped on the sandy coastline of Pemba, hundreds of miles from the nearest oscilloscope, but we knew we had only a few hours to strip it down and get all the salt water out of the complicated electronics, bearings and mechanisms. We carry a lot of tools with us, but we did not anticipate the 300+ screws of 10 different types, from M8 hex bolts, to M2 pozi’s and M3 Torx drives. We were laughed at by the guys working on the Land Rover, with their 10mm spanners and a single screwdriver. Tonight we’ll attempt the recovery, without wrongly sized screwdrivers, and see if we can get this thing back in the sky for the trip home. It’s been an interesting day, full of engineering, personal and team challenges. We’ve succeeded in getting our objectives done, but we’ve learned a lot today about how to make BRCK products world beating in our part of the world. Why do we use technology designed in New York and London Shenzhen for problems in Nairobi and New Delhi, and Shimoni? 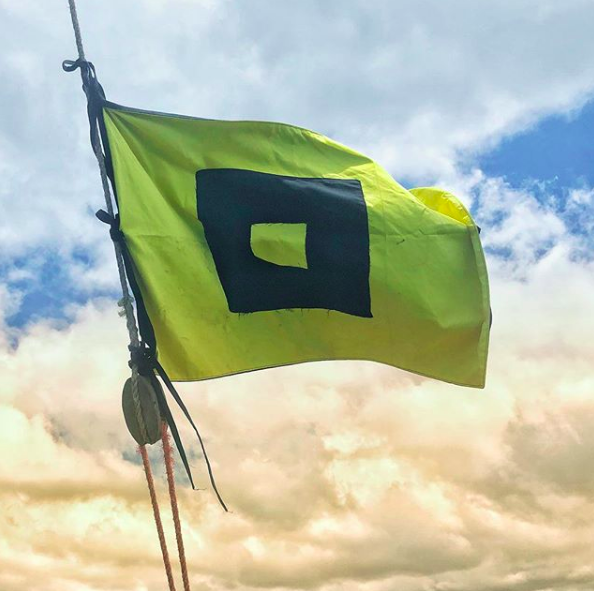 This BRCK expedition to Pemba has been 2 years in the making, and in that time my mind has often considered what it would be like for me to come back to this place. When we left over three years ago, it truly was in a blaze of glory. 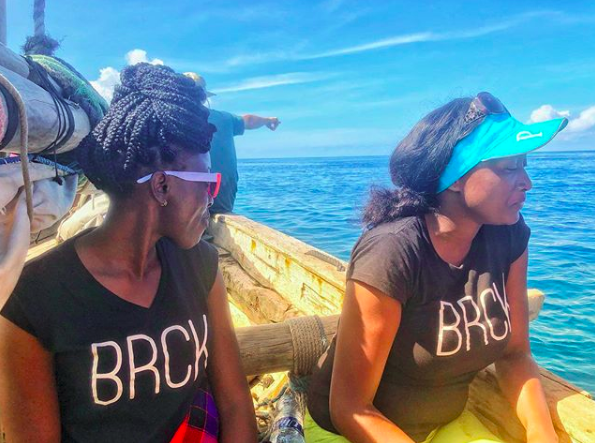 After accepting a new job in Nairobi, we took a final four weeks on the island to pack up and say goodbye, and somehow that last month seemed like a final Good Riddance from Pemba to us, and the same in return. The transformer in our village blew out, and spares from the Zanzibar electrical company were just not coming. Those hot and difficult weeks were spent running a small Honda generator day and night for power, dripping as we packed and planned. That time-frame saw me arrested by a colleague in order to settle a debt between him and hotelier, a deal which I had negotiated and left them to resolve. That stressful dispute finally settled, just a few hours from our departure, and us still sweaty from the many trips to and from our house and the port to pack all of our belongings intro trucks, followed by boats, the brakes on my Land Rover seized on the road to my workshop where I was headed for one final goodbye, and I rolled in with the front hub in flames. With the car still on fire, I rushed into the workshop, and grabbed the fire extinguisher, which I hadn’t needed in our 5 years of life in Pemba, and extinguished our faithful Landy, realizing I’d have to abandon the car for good, still smoldering and to sweat it out – perhaps forever – in our wake. I wished good friends farewell, but the island had sent me off in a bitter fashion. First to the seaport to send all our worldly goods to a new life and new adventure, I boarded a plane for the same, and with all the hassles behind me, I was glad to be leaving for sure. At the port, I remember remarking that this was the last time I’d transport 4 truckloads of luggage between the port of Wete, Pemba and the port of Shimoni, Kenya. Last Sunday however, after nearly 11 hours on the road to get from Chyulu Hills to Simoni, I found myself packing up yet another jahazi, this time in reverse, heading from Shimoni to Wete. After 5 years of transporting furniture from Pemba to customers in Nairobi, the process of moving people and cargo through the port was well known. Three years later I knew the system hadn’t changed, but thought maybe some of the people had. After introductions and declaring the intent of our journey to the immigration officials in Shimoni, we began the arduous process of stamping passports and collecting paperwork for the onward journey. We had to clear with the Kenya police, the marine police, the customs officials and the revenue authority. One clearance document seemed to be slipping from of our grasp. After waking the relevant officials in KRA, we were informed that the form C32, used for importing/ exporting vehicles over the border, had never been used in Shimoni before. In a port that dealt with seagoing cargo, a registered Kenyan car or motorcycle had never been taken through the port. 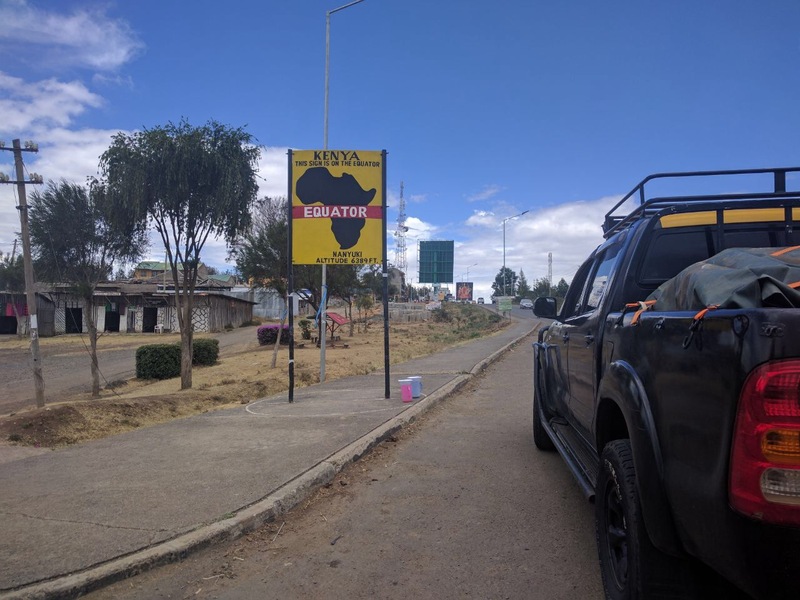 We were told they could order the forms from Lunga Lunga, about an hour’s drive to the Tanzanian border, but with it already being 10pm, it wouldn’t arrive until Monday. We weren’t to be dissuaded or disheartened. A long, winding journey to wake up the owner of the only cyber café/print shop in town allowed us to download the proper form from the internet, print off 4 copies; two for us and two in case some other foolhardy souls decide to follow in our footsteps in the future. After finishing the passenger manifest and submitting it to the maritime police, the ship captain, Hamadi and I started the negotiations for the trip. After realizing that they hadn’t brought the size boat we had ordered (jahazis are slightly smaller, wooden sailboats than the much larger Mashua we had been hoping for) and after seeing how much space the kit of a film crew, 16 people and two motorcycles can take up, we both agreed we were going to need more room or a bigger boat. The perpetual hassle of trips like these are not without a spot of luck from time to time. Another ship captain who was loading coconuts into his boat at the time was headed to another port on the northern tip of Pemba. After 20 minutes of haggling back and forth we came to an agreement and 2 motorcycles and 8 of our passengers would ride with them, and we would sail together to the port of Vumawimbi. 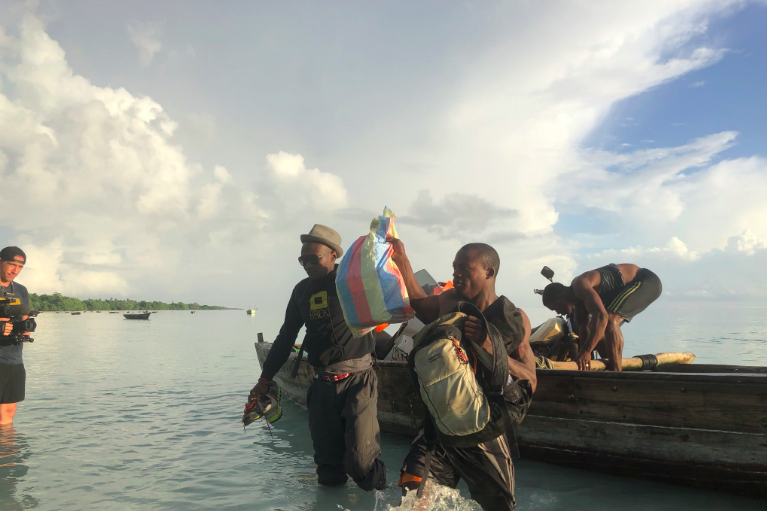 At 1:30 AM, only about 30 minutes behind schedule, all 16 people, 2 motorcycles and all the camera bags, tents, food and personal luggage were loaded, and we weighed anchor and set off for Pemba. After rounding Wasini island, the small landform off Shimoni, we headed out into the open ocean, navigating by the stars, south to Pemba. About 2 hours into the journey the dim, pulsating light of the Kigomasha lighthouse began to shine in the distance. Reassuringly beckoning us to our destination across the channel, from the top of a 120-year-old rickety steel structure, where two days from now we will put in a PicoBRCK weather station, to collect weather data from the area. 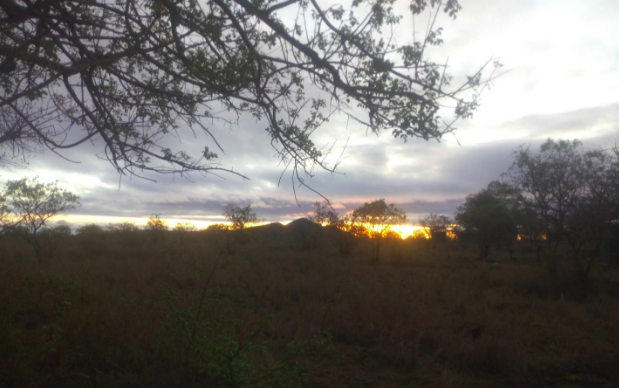 We pulled into Msuka Bay and into the calm waters and white sands of a quiet Vumawimbi Beach just before sunrise, to find our daladala waiting in the shade of an old muarobaini tree. At 6 am, the reunions began. Our driver was an old friend of mine that had driven ox carts and lorries to my shop many times during our time in Pemba, bringing trunks and logs to the sawmill, and hauling away finished product to ship to customers, wherever they may be. After the boats were unloaded (no small feat!) we headed off to Wete by road to clear customs and immigration properly, and to make our ‘official’ arrival into Tanzania. After nearly 24 hours on the road from Chyulu to Wete, we finally dropped our bags at a friend’s house, and dropped the Good All Over crew at the guest house where they’d be staying. Having missed a whole night of sleep, everyone set about getting a little bit of rest – much needed for the saddle-sore motorcyclists and those with knots in their backs from 5 hours of shifting and straining to get comfortable on bags of coconuts. A few hours of shut-eye/siesta and recharge, and then up again to tackle the next few days of testing BRCK product in another logistically challenging locale, this time with the waters of the Indian Ocean surrounding us on all sides. Coming back to Pemba has been like coming home. This time, though, with new eyes, all that is challenging feels like an opportunity. All that is hard rings as worthwhile. My life has had its seasons. I have seen ease and difficulty as it ebbed and flowed. The tide, which inevitably goes out, also comes in again. This time, it brought me with it, and it’s wonderful to be back. I love BRCK Expeditions! I love the intensity, the camaraderie, and – above all – I love the adventure. You never know what is going to happen on a BRCK Expedition and that is what makes them so great. 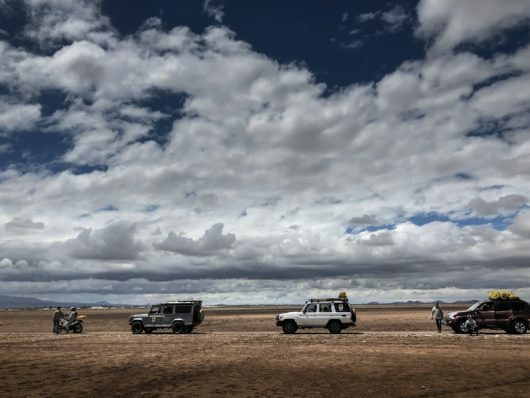 It’s been a couple years since my last BRCK Expedition which was our overland journey to South Africa. As a company we’ve spent this time being heads down working on building a business model for giving away Internet access for free. 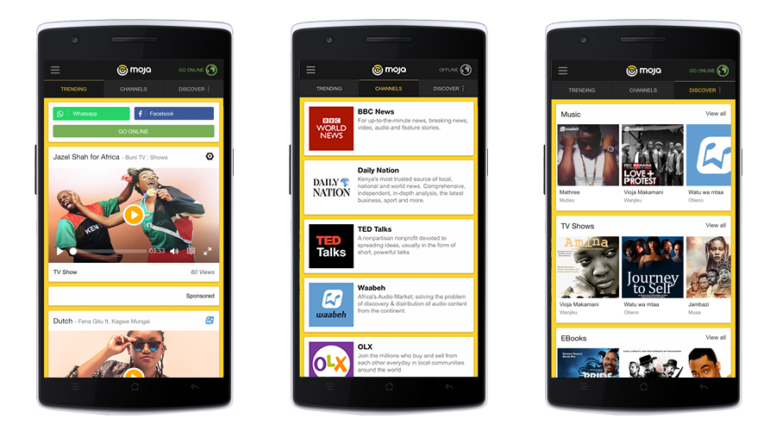 It’s a platform we call Moja (which means one in Kiswahili). Built on the foundation of our amazing new SupaBRCK, this Infrastructure platform brings connectivity to the most remote places and provides an economic model for users who otherwise couldn’t afford connectivity access to the full internet – and a bunch of great content as well. 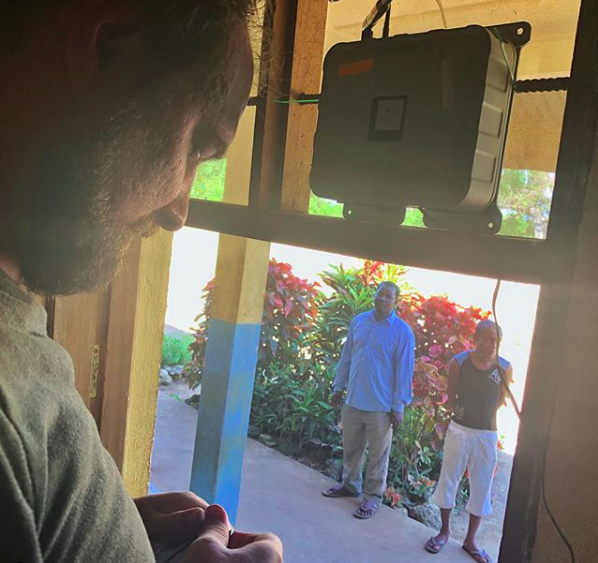 For Expedition Pemba we decided to travel from Nairobi to the northern island of Zanzibar to deploy some Mojas and do some IoT testing. 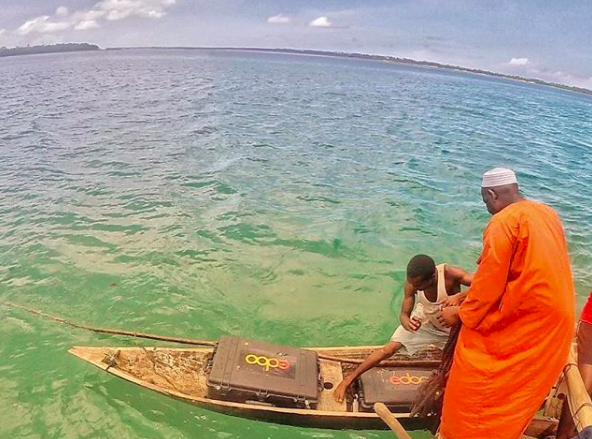 Our Director of Operations, Reid, spent many years on Pemba and he knows the people and community well. 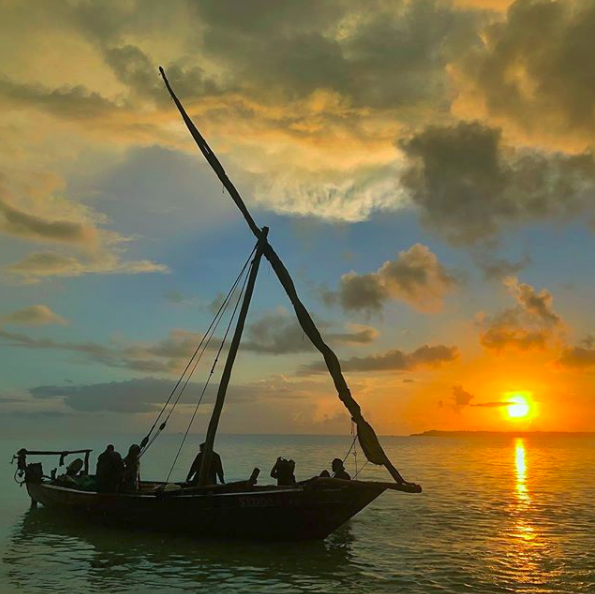 This expedition will involve our usual collection of vehicles and a lengthy dhow ride (a Swahili boat) to the island. It’s only a 10 day trip and we were all feeling it might be just a little too “easy”. Early in the planning stage, Erik received a call from a TV producer named Craig Martin. Craig and his co-host Earl Bridges both grew up in Thailand and now they travel the world capturing the stories of people endeavoring to do good in the world for their program called Good All Over (goodallover.tv). We all watched the trailer and thought that it would be fun to have a couple of TCK’s (third-culture kids like some of us) join us with their cameras. We put out the call to the BRCK team for volunteers and quickly had a crew of 10 ready for adventure. 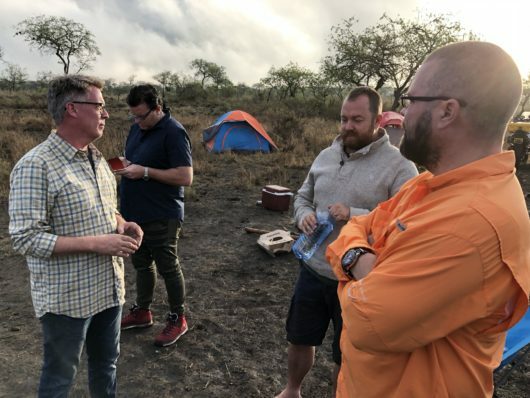 When we were about 2 months out from the trip, Craig casually mentioned that they were bringing an entire film crew with them who would need to join us at every step along the way. We went from 10 to 18 people overnight. 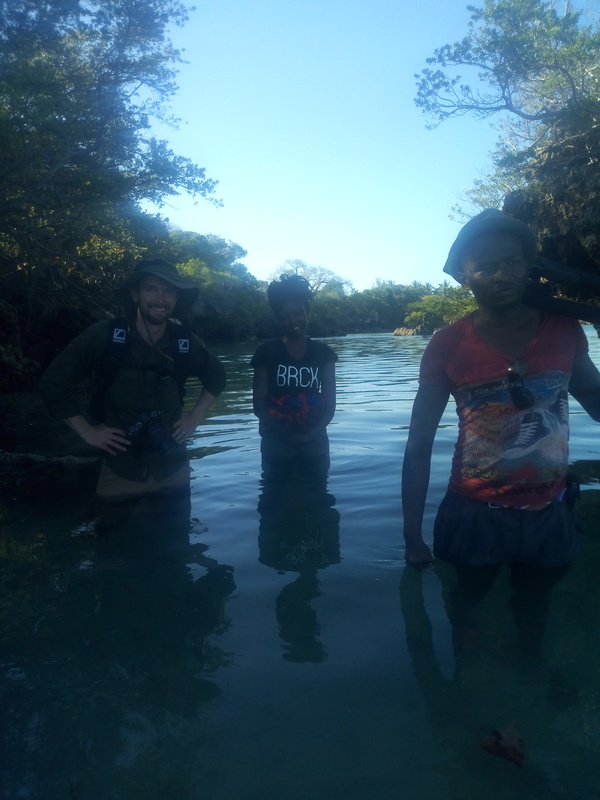 Our Pemba Expedition suddenly was no longer going to be easy. This is my fourth expedition and I have ridden a different motorcycle each time. This year I am on my KTM Adventure 990. A revered adventure bike with off-road credibility. While the bike is extremely capable, it is also very heavy. 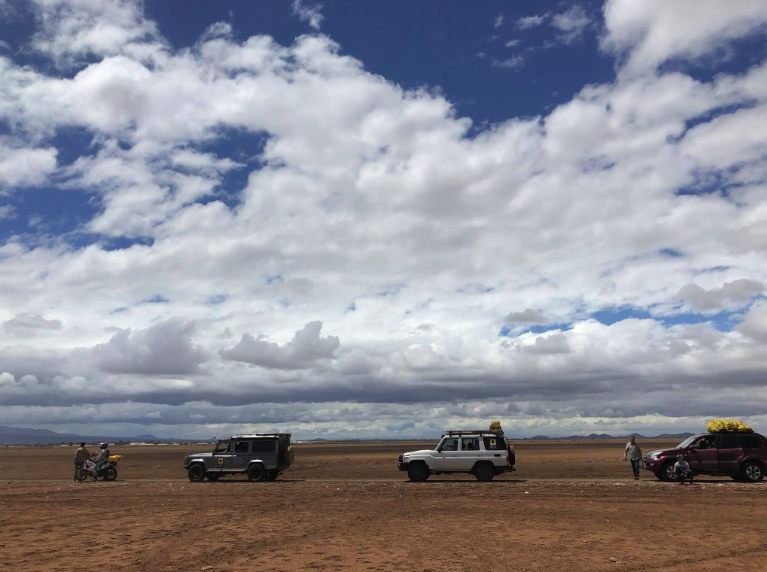 Everything was going well on our first day of riding along the Tanzanian border heading towards the ranger station where we were going to setup a Moja unit. As we headed into the Chuylu Hills for the last 30km, the rain we had been nervously watching on the horizon started to fall on us. Fortunately the direct rain was light but the effects on the road ahead were considerable. As we pushed our way through the volcanic soil and rocks the track grew more and more slick. I laid the big bike down in a pocket of volcanic dust and fortunately jumped off before it hit the ground. Erik helped me right it and we headed off again. Not 1km further down the road, the rut that I was riding in pushed me into a mound of dirt. The heavy bike fell sideways against my leg and Erik, once again, gave the bike a tug to straighten it and we continued. About 3km before our camp the road had become quite slippery. Coming out of a corner my back end came around and I – by pure blind luck – spun the bike 180 degrees without going down. Erik applauded the pirouette and as we pulled into camp Erik commented that the afternoon ride was like watching a man wrestle a buffalo. This expedition is going to be a bit of a buffalo wrestle for the BRCK team. 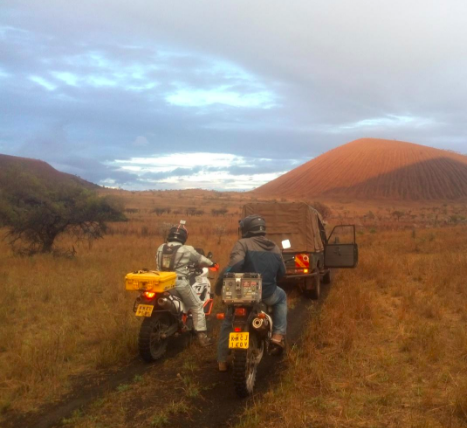 Having 8 extra people who aren’t used to Africa, don’t understand our corporate culture, and who have their own priorities that don’t necessarily align with our own, will make this a truly unique trip. It will be great to share our beautiful home and to expose these professionals to the chaos of Africa. Even in the first day it is obvious that this is going to be an eye opening trip for for the Good All Over team. The late afternoon rain in the Chuylu also brought us an exceptional rainbow. The light cast as the sun set was as stunning as I’ve ever seen. Everything bathed in the light took on a glow of special significance. Even the Maasai cattle – who generally look somewhat scruffy and pathetic – were picture perfect for a Swiss dairy poster. We were all chomping at the bit to stop and take pictures but the sun was setting, the ground was wet, and we still needed to setup camp. Plus, the film crew does not exactly stop and take pictures quickly. 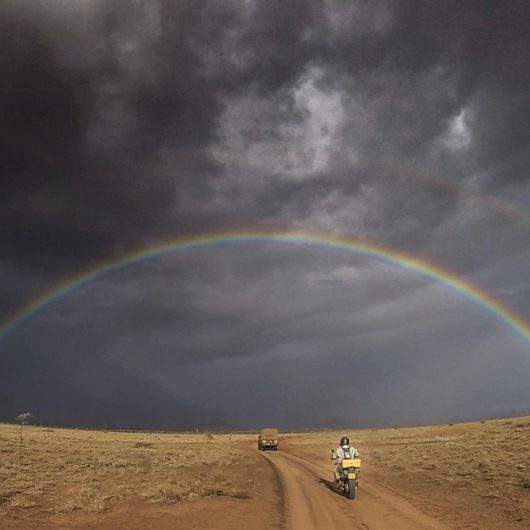 Chasing the rainbow of having a dry camp on our first night, with storm clouds and water columns all around us, seemed an impossible wish. With every turn we would align with another distant downpour and keep pushing. As with our first night in Malawi on Expedition South Africa, at the very last minute we turned into the last spot of clear sky. We arrived at camp as the last rays faded and by 9pm the tents were pitched, our bellies were full with Rinnie’s Famous Chili (a BRCK tradition), and we called it a night in our dry camp. Once again we had achieved the impossible in spite of the challenges around us. Moja is one of those ideas that is going to require the same level of good fortune and indeterminate persistance. 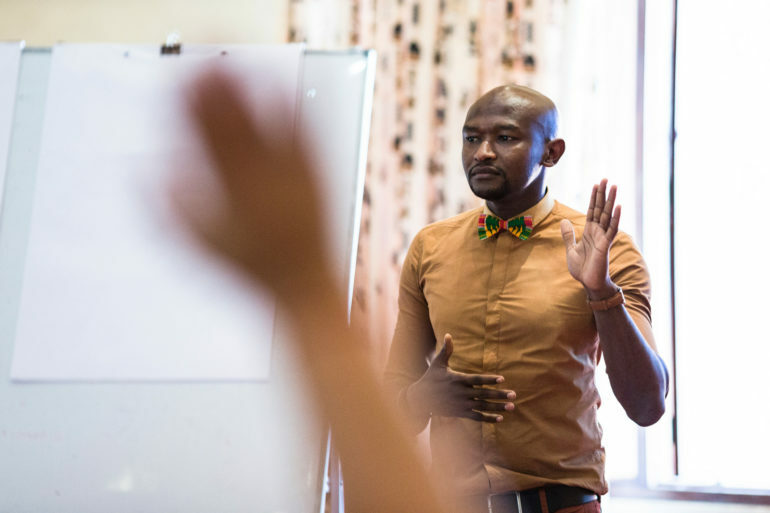 The idea of giving internet away for free to customers that can’t afford to pay and still make a profitable business is another rainbow that is worth chasing. Lion Guardians is a conservation organization that promotes cultural sustainability and coexistence between lions and people across Kenya and Tanzania. Their main camp, Naharbala Camp, is located right in the middle of Amboseli and isolated from the comfortable amenities that you find in urban areas. 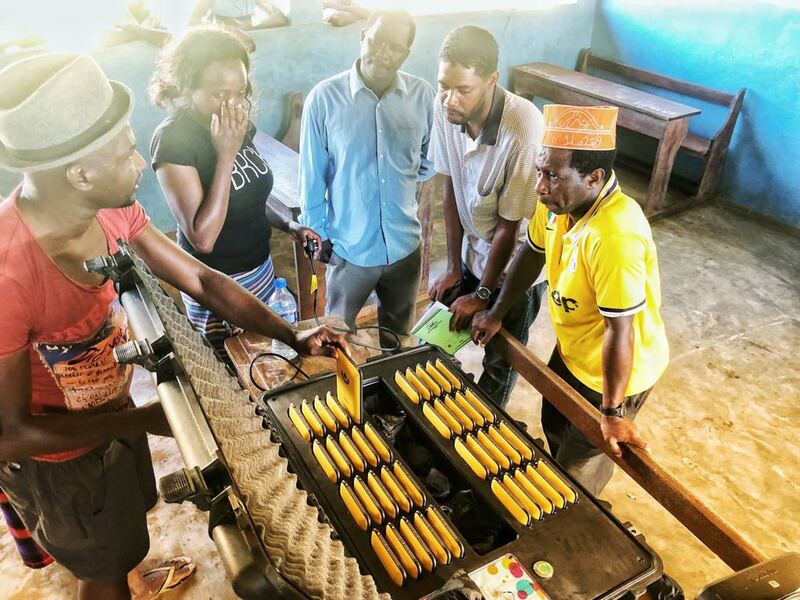 Our four-hour trip from Nairobi led us to a camp that relies on Solar power to generate electricity for the camp’s infrastructure operations. 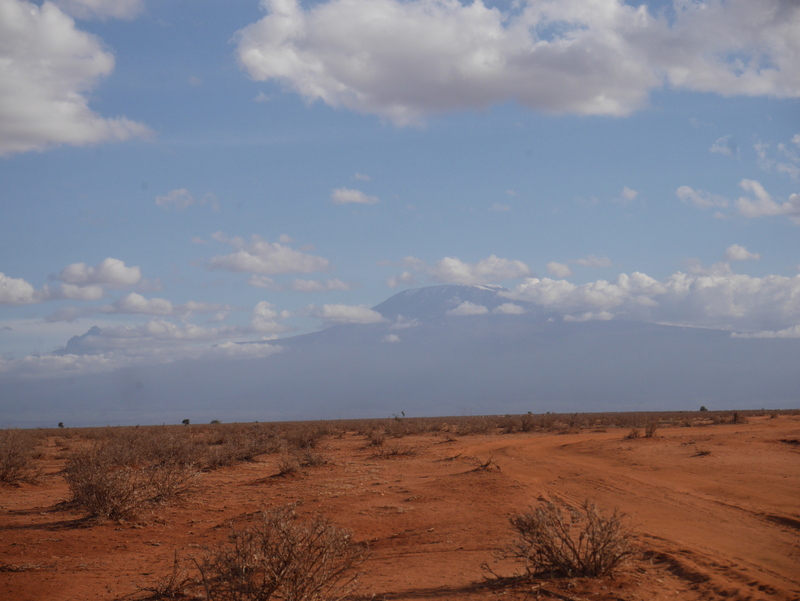 Amboseli, a landscape of wonder filled with a dry and sprawling grassland, scattered trees and diverse wildlife. This was our destination on Valentine’s day this year, a team of three BRCK employees consisting of Robert our driver, Jimmy, an electrical engineer and me. Foregoing the day of love to solve a long-term connectivity issue, we set out early that Tuesday morning. Upon arrival we were welcomed by Dr. Leela Hazzah, the organization’s Executive Director, she explained to us the issue that had been plaguing them: for the past one year, the camp has experienced poor internet connectivity and has been on a satellite backhaul that has proved to be inefficient in terms of slow speeds and intermittent connectivity. 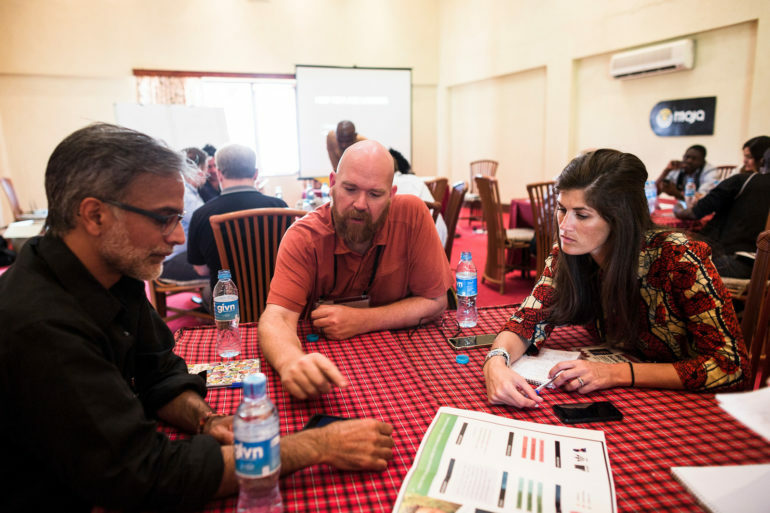 Internet is an important tool for Lion Guardians in regards to communicating with international partners and performing research work. 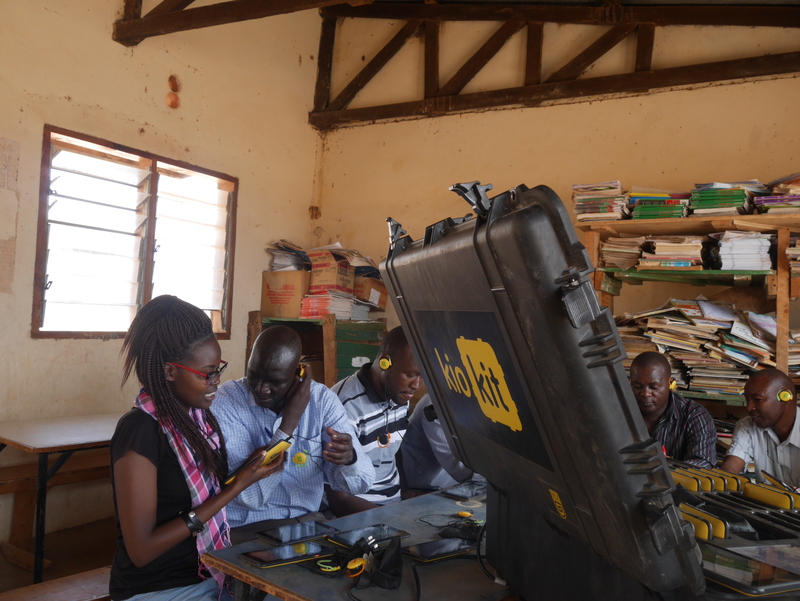 The existing internet connectivity setup included a satellite antenna, a modem, WiFi extender (Ubiquiti UniFi AP Outdoor) and solar charged batteries that powered the whole camp apart from the equipment. 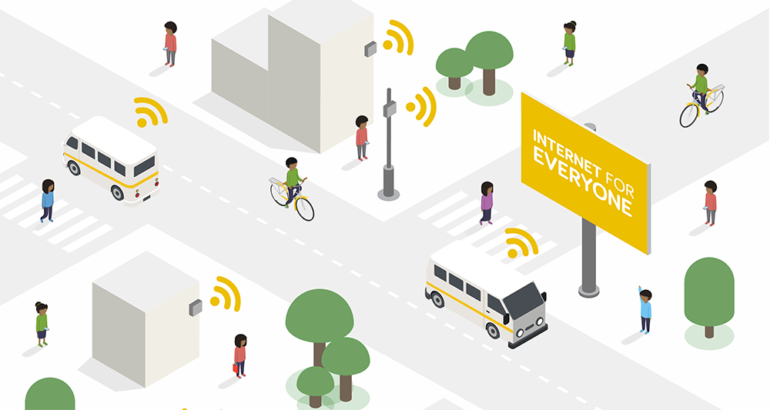 With the advent of 3G network in Kenya ten years ago, majority of areas in Kenya including rural towns and remote areas have access to fast mobile internet speeds. The Naharbala camp has four Safaricom cell towers surrounding it and include: Kinama, Imbirkana, Lengsime and Amboseli Serena. 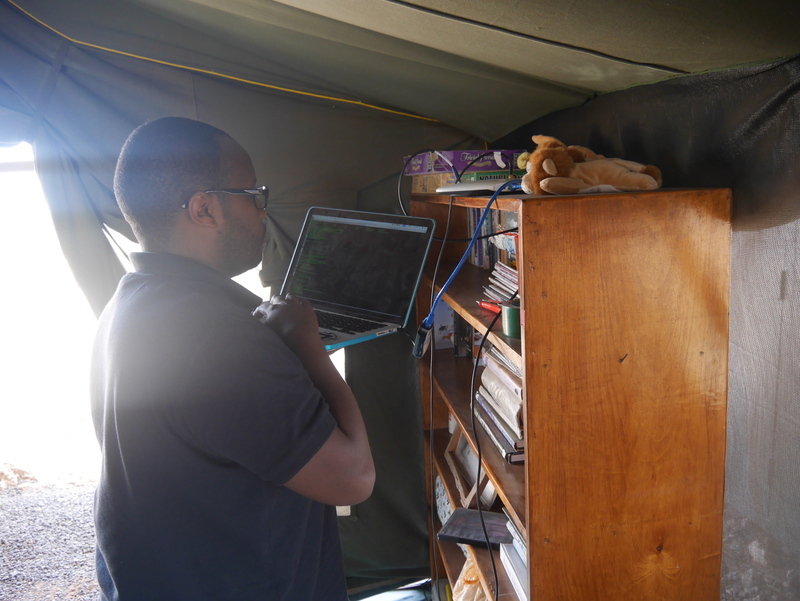 The availability of adequate mobile network infrastructure provided BRCK an opportunity to test out the BRCK at the camp. 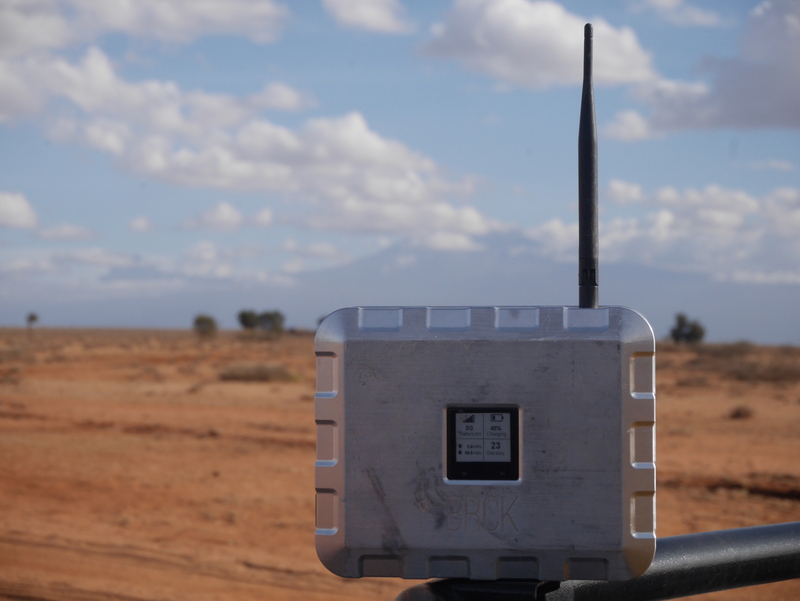 We installed the BRCK device with a GSM antenna and tested which cell tower to point to. 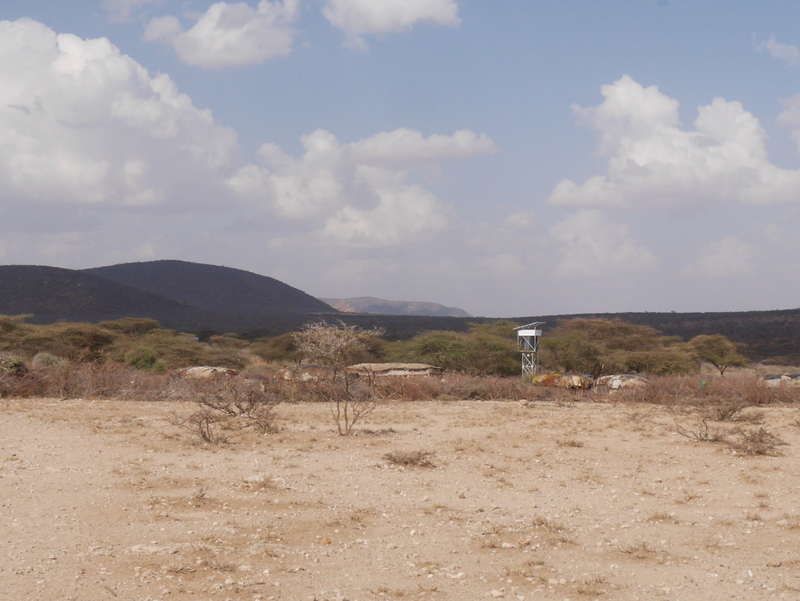 The cell tower at Kinama provided the best Safaricom reception signal. In addition to this simple setup, we connected the existing WiFi extender to provide wide coverage across the camp. With the setup in place, Dr. Leela and the rest of the camp were able to access 7Mbps internet and even make a Skype call, something we urbanites take for granted. The installation was a success and the BRCK team of three departed in the late afternoon satisfied with a well done job. However, two weeks later, the internet connectivity stopped operating and this prompted two more trips to Naharbala camp to identify the issue. We suspected that the issue was the mobile network signal and frequency. So we installed a GSM/3G signal booster but even this did not solve the problem. 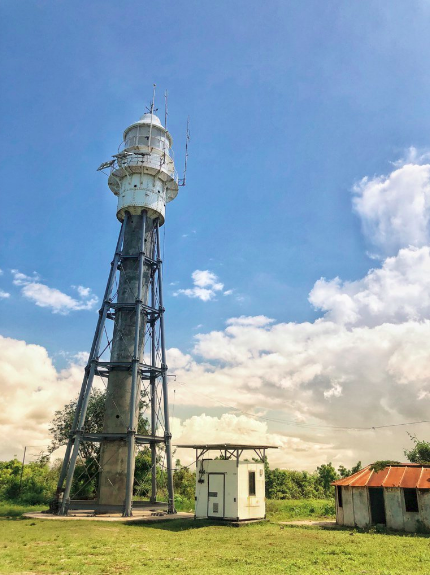 We came to a conclusion that the towers were transmitting on EDGE frequency (900MHz) and this would fluctuate to 3G (1200MHz) after a while and internet connectivity would resume. To our relief, Dr. Leela informed us that another conservation camp (focusing on Baboons) within Amboseli was experiencing the same problem and that Safaricom engineers were scheduled to do repairs and maintenance at the Kinama cell tower. At the time of publishing this blog, the internet connectivity remained intermittent due to the mobile network signal issue. 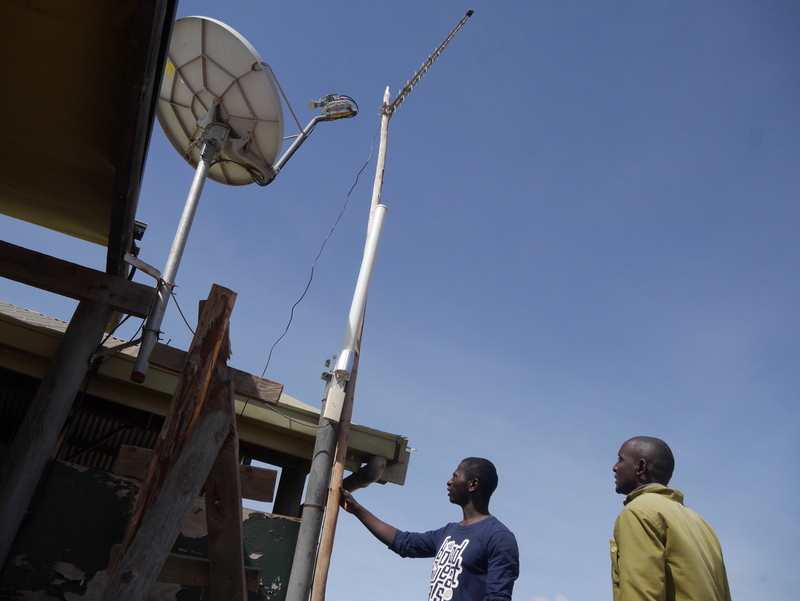 BRCK’s goal is to connect Africa but it’s also important for the backhaul infrastructure such as mobile or satellite to be stable and efficient.